I’ve been wanting to paint this view for the last five or six years. When I used to work on archaeological digs, one of the jobs was in advance of a motorway between Fermoy and Mitchelstown. On the commute trip, I would pass this place twice a day. It’s on the Dungourney to Castlelyons road, at a townland called Curraghdermot. An amazing view of two mountain ranges in Munster is on the horizon. On the left are the Galtees, straddling the border between Limerick and Tipperary. 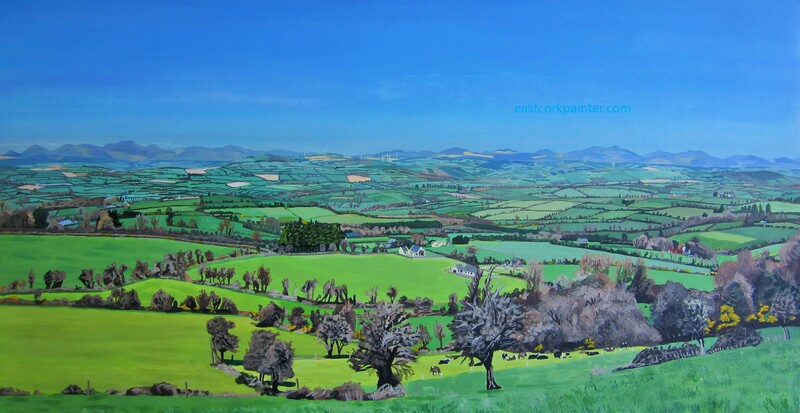 On the right are the Knockmealdowns that form part of the border between Waterford and Tipperary. So even though I’m standing in County Cork, three counties can be seen. The location is in front of a disused field entrance, next to a disused lay-by. At around 600 feet up, it’s on some of the highest ground in East Cork. I painted it all outdoors from life. 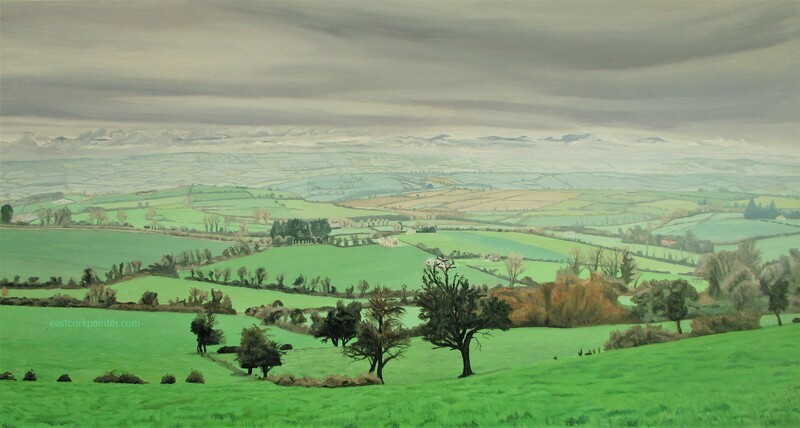 I had enough fine days to complete the painting, due to an unusually long, warm, spell of weather. It’s a landmark picture for me, as it shows I can do a detailed painting from life and not be reliant on photo references.